It is an interesting thing. Throughout the last four decades there is a direct link between the actions of the Federal Reserve and the eventual economic and market outcomes due to changes in monetary policy. In every case, that outcome has been negative. I urge you not to fall prey to the “This Time Is Different” thought process. Despite the consensus belief that global growth is gathering steam, there is mounting evidence of financial strain rising throughout the financial ecosystem, which as I addressed previously, is a direct result of the Fed’s monetary policy actions. Economic growth remains weak, wages are not growing, and job growth remains below the rate of working age population growth. While the talking points of the economy being as “strong as an ox” is certainly “media friendly,” The yield curve, as shown below, is telling a different story. While the spread between 2-year and 10-year Treasury rates has not fallen into negative territory as of yet, they are certainly headed in that direction. This is an important distinction. The mistake that most analysts make in an attempt to support a current view is to look at a specific data point. However, when analyzing data, it is not necessarily the current data point that is important, but the trend of the data that tells the story. 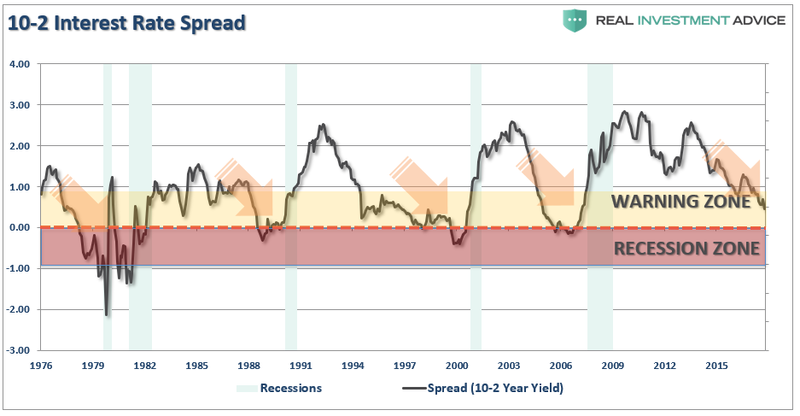 Currently, the trend of the yield curve is highly suggestive of economic growth not being nearly as robust as the mainstream consensus believes. Furthermore, economic cycles are only sustainable for as long as excesses are being built. The natural law of reversions, while they can be suspended by artificial interventions, cannot be repealed. In a consumer based economy, where 70% of economic growth is driven by consumption, you have to question both what is driving consumer spending and how are they funding it. Both of those answers can be clearly seen in the data and particularly in those areas which are directly related to consumptive behaviors. When a bulk of incomes are diverted to areas which must be purchased, and have very little of a “multiplier effect” through the economy, spending on discretionary products or services becomes restricted. The mistake the Federal Reserve, and the Administration, are currently making is by hitting consumers where they have the LEAST ability to compensate – interest payments and the items required for daily living like food and energy through tariffs. Despite the recent “windfall” from tax reform, corporations aren’t “sharing the wealth” as consumption trends remain weak. 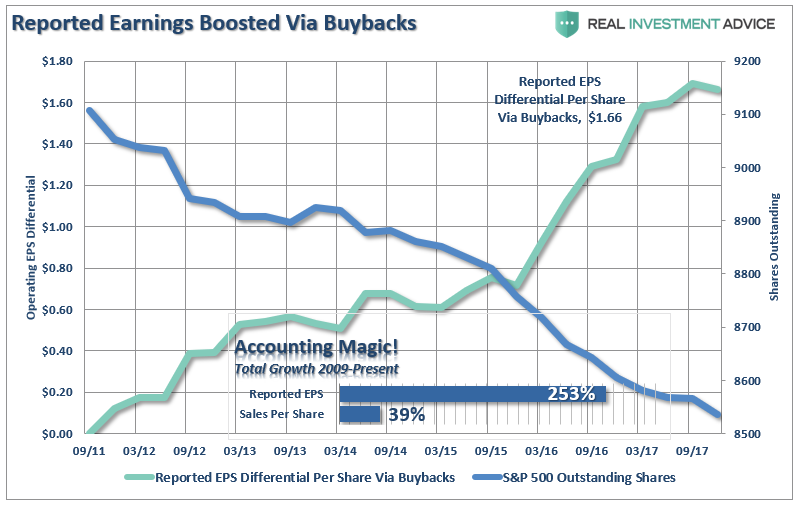 When revenue, what happens at the top line of the income statement, remains weak, corporations continue to opt for share buybacks, wage suppression and accounting gimmicks to fuel bottom lines earnings per share. The requirement to meet Wall Street expectations to support share prices is more important to the “C-suite” executives than being benevolent to the working class. The chart below shows is the differential between the standard of living for a family of four adjusted for inflation over time. 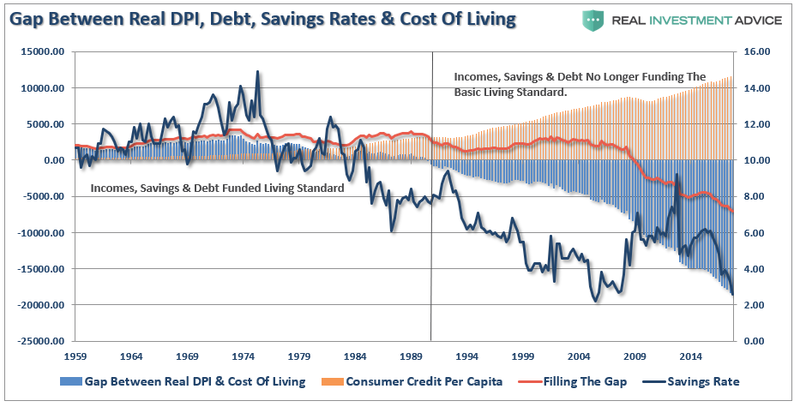 Beginning in 1990, the combined sources of savings, credit, and incomes were no longer sufficient to fund the widening gap between the sources of money and the cost of living. With surging health care, rent, food, and energy costs, that gap has continued to widen to an unsustainable level which will continue to impede economic rates of growth. Credit risk is already on the rise as consumers are much more sensitive to changes in rates. 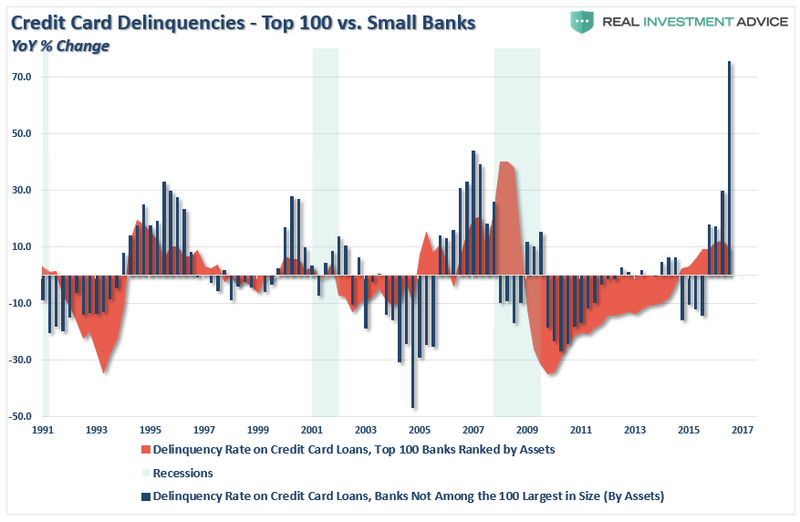 As the Fed continues to hike rates the negative impact on households will continue to escalate which is already showing up in credit card delinquencies. Of course, it isn’t just credit card debt that is the problem. Subprime auto loans are pushing record levels as consumers have been lured into “cars they can’t afford” through low-rates and extended terms. Consumers have also completely forgotten the last financial crisis and have once again turned to cashing out equity in homes to make ends meet. 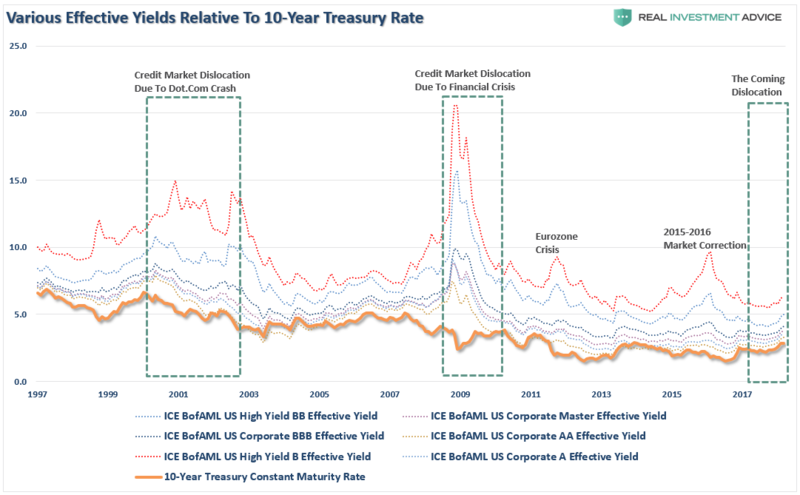 Eventually, since a lot of this debt has been bundled up and sold off in the fixed income markets, this all ends badly when, as Stephanie states, the markets begin to reprice risk across the credit spectrum. As shown, when the spreads on bonds begin to blow out, bad things have occurred in the markets and economy. As debts and deficits swell in coming years, the negative impact to economic growth will continue. At some point, there will be a realization of the real crisis. It isn’t a crash in the financial markets that is the real problem, but the ongoing structural shift in the economy that is depressing the living standards of the average American family. There has indeed been a redistribution of wealth in America since the turn of the century. Unfortunately, it has been in the wrong direction as the U.S. has created its own class of royalty and serfdom. Do Stocks Really Like Higher Rates? Analysts’ Estimates Go Parabolic – Is The Market Next?